The largest passenger ship rescue in modern times took place off the coast of Norway at the end of March. 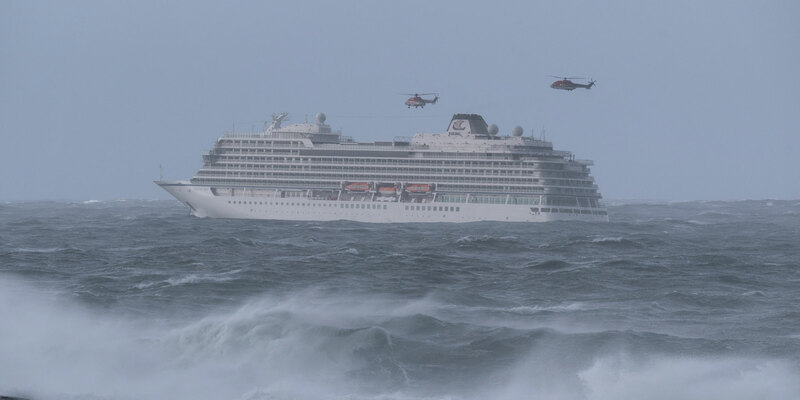 Heavy helicopters, including CHC Sikorsky S-92s and Airbus AS332s, hoisted 479 people to safety over the course of 18 hours from the crippled cruise ship Viking Sky in harrowing conditions that included winds up to 45 knots and waves that approached 50 feet. The ship was in imminent danger of foundering into a rocky coastline after its engines shut down on March 23 near Hustadvika. The ship was en route from Tromso to Stavanger on a 12-day cruise that began in Bergen and was scheduled to end at Tilbury, UK. Its engines failed due to low oil pressure exacerbated by heavy seas, according to the Norwegian Maritime Authority. The ship managed to set anchor between Alesund and Trondheim, a mere 300 feet from hitting submerged rocks and 900 feet from shore. Inside the 749-foot vessel, interior cabin panels collapsed onto passengers and furniture was strewn about on a Poseiden-like adventure for the 1,373 customers and crew aboard. At least 17 were injured. The Viking Sky was delivered new in 2017 to Switzerland-based Viking Cruises. CHC received a call for assistance from Norway’s National Rescue Service (HRS) at 2 p.m. local time Saturday, March 23. It responded with six crews from its bases at Floro, Heidrum, Statfjord, and Sola and support from its Stavanger operations center. The crews included 12 pilots, six hoist operators, seven rescue swimmers, one systems operator, and two ground support engineers. The crews flew four CHC aircraft to the ship—two all-weather, SAR-configured S-92s and two AS332s. Two more S-92s were used in the effort; one for crew transport and another standing by at Bronnoysund to cover for an S-92 dispatched from Heidrun. By 2:30 p.m. local time, the first CHC helicopter, an AS332L1 on contract with the Norwegian Ministry of Justice, began hoisting the injured off the deck. A second AS322L from Heidrun arrived on scene shortly thereafter. Some 15-20 passengers were lifted off the ship at a time. It soon became apparent that more helicopters could be needed and CHC’s operations center put out the call for two more SAR helicopters to be dispatched from Kristiansund. From the shore, a Norsk Luftambulanse Airbus EC145 transported the injured to area hospitals. As evening approached, nearby the cargo ship Hagland Captain also experienced an engine failure. The CHC helicopter based at Floro was redirected to this ship and that helicopter, along with a Sikorsky Sea King from the Norwegian Ministry of Justice, hoisted nine crewmembers to safety. By late Sunday morning, the Viking Sky was able to restart three of its four engines and was accompanied to Molde by two tugs where the remaining passengers and crew disembarked. The Viking Sky hoist-off operation was reminiscent of when the Greek passenger ship Oceanos lost power and listed over in 40-knot winds and 30-foot seas off Coffee Bay along the coast of South Africa in August 1991. In that case, 16 rescue helicopters, including 13 South African Defense Force Pumas, hoisted 225 persons off the deck after the captain and most of the crew abandoned ship, leaving the passengers to fend for themselves. Additional assistance was provided by a nearby cargo ship and all 571 onboard were saved. “This is what we train for and can execute when we are called upon,” said CHC chief SAR pilot for Norway, Patrick Gerritsen.